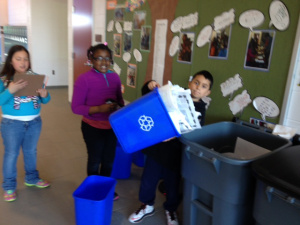 This is the fourth week of collecting recycled paper from all the classes on the second floor. This week we collected nearly 200 pounds of paper. Let’s keep up the great work! In addition to collecting recycled paper, the 3rd grade classes have been busy studying how we get our water. In honor of H2O, this week’s “Go Green” tip is: When you brush your teeth, turn off the tap to help save water! « Week #3 GEHMS improves paper recycling! Great ideas! Keep up the good work third graders!